Our first week has been absolutely packed with activities related to natural resource restoration work. 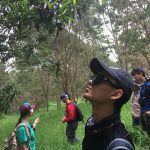 At Laupahoehoe, we learned about a disease facing Hawaii’s culturally important Ohi’a trees called “Rapid Ohi’a Death” and the steps US Forest Service workers are taking to prevent its spread. We then helped weed an experimental Ohi’a tree nursery. We stayed in the spacious cabins and cooked in the mess hall at Kalopa State Park, an arboretum with fantastic hiking trails. 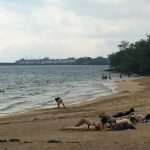 After a rainy night at Laupahoehoe Beach Park, we migrated over to the Kohala coast to dry out, camping at Spencer Beach Park where we explored the nearby reefs, the adjacent Heiau (Hawaiian temple), and generally enjoyed life on a sunny and sandy beach. 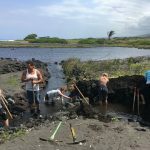 Heading south to Kawa Bay, we assisted managers of an Ahupu’a’a (a traditional land division) in protecting native plantings and digging out the feeder spring for a fish impound pond. Our hosts introduced us to their vision for this district, as well as a variety of edible fruits and an extremely spicy type of pepper. 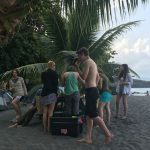 That night we camped on the beach below the cliffs at Hookena and awoke in the morning to spinner dolphins cruising the bay outside of our tent doors. We spent the morning snorkelling the reefs at Hookena before heading north to do some much needed laundry and resupply in Kailua-Kona. We arrived at the dormant volcanic cinder cone called Pu’u Wa’a Wa’a on the slopes of Hualalai where some of the last tropical dry forest on earth are being preserved and restored. Staying in the spacious, seventies-chic “Lake House,” we traversed the cattle pastures interspersed with green houses and restoration gardens to climb the Pu’u (cinder cone). 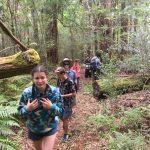 Our guides helped us reach an intimate familiarity with some of the native plants being reintroduced into the forest at the summit. 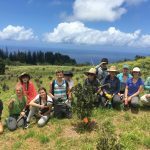 Back down in the forest reserve, we helped Forest Service personnel plant a dozen different species of endangered grasses, shrubs, and trees, many of which are extinct in the wild and exist only in the Ahupu’a’a of Pu’u Wa’a Wa’a. In all, it’s been a week of deep learning though rare access to unique corners of this remarkably diverse island and its wonderful and welcoming residents!